Need more information about booking Home 464155 ? All the modern conveniences a digital TV and DVD player and the cooking equipment needed for self catering. You will enjoy a relaxing location but with every facility close to hand. Super Fast Fibre Broadband via ethernet & Wi-Fi for our holiday guests at the holiday house. Holiday house boasts a large sliding patio door leading from the lounge to a private furnished patio with superb views of the sea. At the end of the evening, retire to our comfortable double bedroom or cosy single bedroom, both with sea views. There is a bus stop right outside the holiday house. With Poole Bus station acting as a hub, you can get to any local attraction without having to use your car! We pride ourselves in providing good quality clean accommodation. All linen and white fluffy towels professional laundered are provided incl beach towels. Well behaved small dog and children are welcome. BUT we ask the holiday house to be returned in the same condition as given. This House has 2 bedrooms, 1 bathroom and sleeps 3. It’s been listed on Holiday Lettings since 15 May 2013. Located in Poole, it has 17 reviews with an overall rating of 4.5. The average weekly rate is £1031. The Owner has a response rate of 80% and the property’s calendar was last updated on 11 Oct 2018. A perfectly located bargain. We stayed here for a week in May and will definitely be booking again. This holiday rental made us feel relaxed from the moment we opened the door. Light, airy and open we unpacked quickly and had drinks on the patio! Walking along to the quay with its chilled out continental feel then returning to the quieter area just along the sea front was the perfect antidote to our busy lives. There are lots of ideas of places to visit left in the accommodation, but make sure you visit the Blue Pool and take the ferry to Studland. We will undoubtedly stay here again when we return. Owner's reply: Thank you for your review. Our goal is for our holiday guests to have a nice relaxing holiday. A review like this means we are meeting our goal! Thank you and look forward to you staying with us again. This suited us perfectly. The house was within easy walking distance of the harbour and of shops and had everything we needed for a great holiday. We have already provisionally booked another stay. Quayside is a exceptionally well presented, clean, tidy and very nicely decorated holiday home. 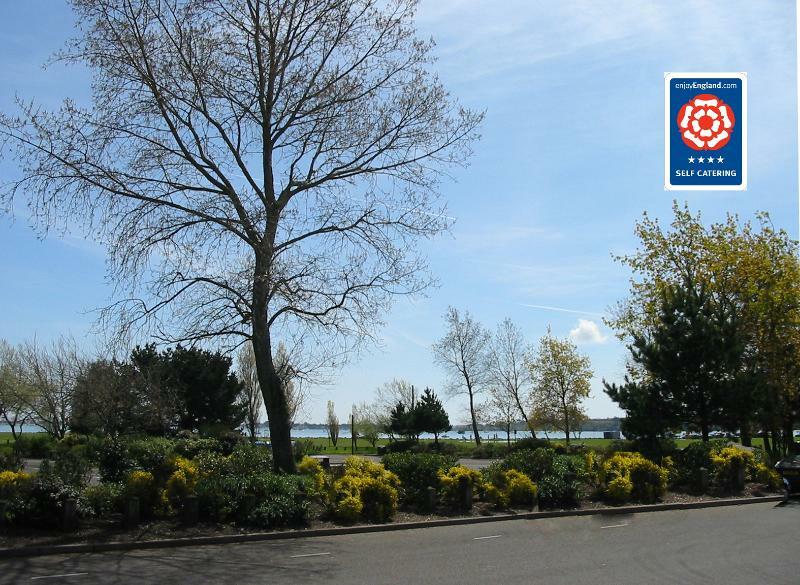 Situated on the edge of a housing development opposite Baiter Park, ideally situated for walking to Poole Quay which is around a 10-15 minute walk from the property. There is a bus stop directly outside the property where you can get on or off the Route 1 bus should walking not be an option. The Poole land train also passes outside the property. The supermarket is only a couple of minutes drive away, or a 10 minute walk if you prefer. The property consists of a small lounge with flat screen colour TV, hi-fi unit, Plusnet super fast wireless broadband, seating, tables and patio doors to an outside seating area with tables and chairs. There is a dining kitchen with a range of modern appliances, including a fridge freezer, electric oven and hob, washer/drier, microwave, toaster etc. Upstairs there are two bedrooms, a double, a single and a small family bathroom with bath and overhead shower. Everything you need can be found in the property. An allocated off road parking space is directly outside the property. The property is not huge and it is at the side of a road that can get quite busy and a little noisy at times, that said we found the open space and the views from the house to be much more pleasant than those offered in many of the very expensive holiday lets available in the exclusive Sandbanks area. It is also better situated for the attractions Poole has to offer. Owner's reply: Thank you for your review. Our goal is for your holiday guests to have a relaxing and stress free holiday..
You can get in touch with Simon and Dawn (the owner) through the contact form on this page. Send Simon and Dawn (the owner) an email through the contact form on this page. Alternatively, if there’s a phone number on this page, you can call them. How do I contact Simon and Dawn (the owner)? If you’ve already booked, go to Manage your holiday booking to view Simon and Dawn the owner's contact details or send them a message. Or send Simon and Dawn (the owner) an enquiry through the Contact the owner/manager form if you’d like a quote or more info first. When you pay online through the Book your stay form, a booking request is sent to Simon and Dawn (the owner). You’ll find out within 24 hours whether they’ve accepted - no money will leave your account before then. You can also request a quote from Simon and Dawn (the owner) through the contact form. The owner will email you the total cost for your dates and a link to book and pay online. Use the Book your stay form to pay provisionally online. You can pay by credit/debit card or PayPal. Simon and Dawn (the owner) will have 24 hours to accept the booking and no money will leave your account before then. Why can't I call Simon and Dawn (the owner) before booking? You’ll need to contact Simon and Dawn (the owner) to do this. Send them a message in Manage your holiday booking or through the contact form on this page. You can request to change the dates or number of people on your booking via the Manage your holiday booking page. To change your holiday dates use the Edit booking button. If you need to change the number of guests staying then send Simon and Dawn (the owner) a message. If Simon and Dawn (the owner) agrees, they’ll send you a revised quote outlining the changes. You can review and accept/decline this from the Manage your holiday booking page. You’ll have 48 hours to take action before the revised quote expires.